Christmas wishes and kisses – Warm and aromatic, saffron and myrrh. Dreaming of a white Christmas – Lily, rose, mandarin, lemon and vanilla. Every snowflake is a kiss – Heady sandalwood and delicate mandarin blossom, combined with soft apricot, white hyacinth, sweet pea, jasmine and ylang ylang. It’s beginning to look a lot like Christmas – Vibrant and spicy, warm and comforting woody notes with hints of clove and orange. Most wonderful time of the year – Highlights of oriental cassis, green notes and a warm centre of freesia may rose and lily. 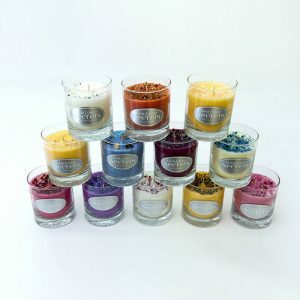 These rest on cedar, sandalwood, amber, sugar and vanilla. Santa Claus is coming to town – Warm and fruity clementines, cranberries and orange. All I want for Christmas is you. – Heather, lavender and juicy raspberries. Believe in the magic of Christmas – A rich fruity fragrance of cassis and raspberries with leafy green notes. A heart of magnolia and lily of the valley with notes of wood and musk. The Best Christmas present is love – The perfect citrus blend of bergamot, lychee, mandarin and tuberose. There are also base notes of caramel, vanilla, sandalwood and musk. May your days be merry and bright. – Aromatic and spicy fragrance of saffron and myrrh. Let it snow, let it snow, let it snow. – Fresh bergamot, lemon, neroli, cyclamen and sandalwood. Chestnuts roasting on an open fire – Festive, warm and a little spicy.